6 million years ago, but we don't have a more accurate idea of exactly when it became extinct. Where did it live? The remains of this bird have been found in Argentina. The two species of condor that inhabit the Americas are enormous birds. If you have ever seen one of these birds for real or television footage of one of them tearing at the carcass of a dead animal, you'll appreciate just how big they are. They can be around 1.1 m tall, and their wingspan can be as much as 3.1 m. In the sky, these birds use their huge wings to soar for hours on updrafts of warm air, surveying their immense territories for food. With the living condors in mind, let's travel back in time around 6 million years and visit Argentina. Back then, the Andes were only starting to form due to the tectonic forces that pushed the Pacific plate under the South American plate. As a result, the flat grasslands of Argentina were swept continuously by westerly winds. High above these plains, soaring effortlessly in the sky, was the largest flying bird that has ever lived: the magnificent teratorn. The wingspan of this immense bird was about the same as a small airplane, at 6 to 8 m, and it probably weighed in the region of 80 kg, possibly more. This is really heavy when we consider that the heaviest flying birds today, the great bustard (Otis tarda) and the kori bustard (Ardeotis kori), are around 20 kg. Standing, the magnificent teratorn was 1.5 to 2 m tall. Bird skeletons are very fragile, and it is very rare to find an intact one that has stood the test of time. All the vital statistics of this giant have been extrapolated from a few bones found in Argentina. Paleontologists have unearthed some of the wing bones, fragments of the feet, and portions of the skull. Even though we only have fragments, it is possible to piece together a realistic reconstruction of the entire skeleton, and from there, we can build up a picture of how the living animal may have looked and how it may have lived. 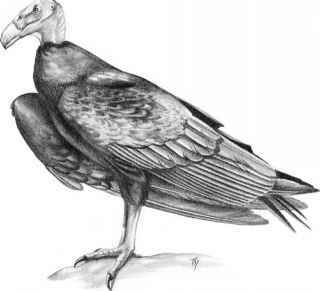 The teratorns are related to the New World vultures, for example, the condors. Like the other teratorns, the magnificent teratorn had a hooked bill, so it must have been a meat eater, but how did it go about finding its food? Three plausible ways of life have been proposed for this extinct bird. Some experts have suggested that this bird was an active hunter that swooped down and caught animals as big as hares while on the wing, whereas others believe that it behaved in the same way as the modern-day condor, alighting near a carcass and feasting on the flesh. Another possibility is that this giant spent a lot of time stalking the pampas on foot searching for tasty morsels. After carefully inspecting the skull bones of this bird and its relatives, scientists have proposed that a magnificent teratorn's skull was not really up to the task of tearing the hide and flesh of dead animals. It may have relied on other animals to tear the hide, such as the saber tooth predators, which lived at the same time. These powerful mammals were undoubtedly able to bring down prey much larger than themselves, so there was definitely a source of big, dead animals for a giant scavenger. Perhaps these birds used their immense size to intimidate predators and chase them away from their kill? Using the information we have on living scavenging birds, it is possible to estimate the size of the territory this giant bird needed to find sufficient food for itself, and it is something on the order of 500 km2. To survey such a huge territory, the magnificent teratorn must have been on the wing almost continually. Fortunately, a huge wingspan is perfect for effortless gliding on the thermal updrafts that rise up from the pampas. However, there is the one problem of how such a huge bird got airborne if it was on the ground. Massive wings cannot be flapped effectively when you are grounded, and it has been estimated that to get airborne, the teratorn needed to reach a ground speed of 40 km per hour. This is quite fast and beyond the capabilities of the teratorn's feet, which seem to be built for sedate stalking. The solution to this problem could have been the strong, incessant winds that blew across the South American pampas and Patagonia. The magnificent teratorn may just have needed to turn its outstretched wings into the wind, and the speed of the moving air probably lifted it into the sky. It may have also become airborne by running down a slope or dropping from a high perch. The wandering albatross (Diomedea exulans), which has the greatest wingspan of any living bird, takes to the air by stretching its wings and running into the wind. Using what we know about living birds, we can piece together other parts of the magnificent teratorn's life. Such a large bird must have definitely been very long-lived. The living condors can live for at least 50 years, so the extinct giant could have lived to a very old age. Long life is associated with slow breeding, and this huge bird may have only reached sexual maturity after its twelfth year. Once it was capable of producing offspring, it is highly likely that only one chick was reared every two years. Where they constructed their nest and what it looked like is a mystery, but it may have been a simple affair of a few twigs surrounding the 1-kg egg on a substantial cliff ledge that gave the adults sufficient space to take off and land. Great age, slow development, and a low reproductive rate are good reasons for a bird to remain with the same mate for its whole life, and it is an intriguing thought that these giant, long-dead birds, known only from a few bones, formed pair bonds that lasted their entire reproductive life. It would be a fabulous sight to see a bird of the magnificent teratorn's enormity gliding over the South American pampas and Patagonia, but this animal has long since disappeared from the face of the earth. 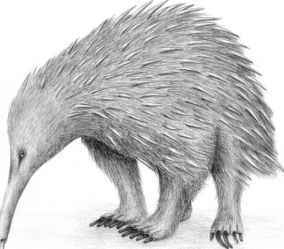 Its demise cannot be attributed to the changes that occurred at the end of the last ice age, changes that coincide with the disappearance of other American megafauna. We can't attribute its demise to our own species as it disappeared a long time before modern humans arrived on the scene in the Americas. It is likely that as the Andes rose into the air over millennia, the perpetual westerly winds that scoured the pampas were reduced. It is also possible that the strong westerly winds shifted to the south as the postglacial climate changed. Without these strong winds to give them a helping hand into the air, these giant birds may have simply been too large to fly, and over thousands of years, they slowly died out, leaving just fragments of their bodies to provide us with a window to the distant past. ♦ Four other teratorn species have been identified, but the species described here is the only one known so far from South America. Bones of two of the other species have been found in great abundance in the asphalt deposits of Rancho La Brea, Los Angeles (see the "Extinction Insight" in chapter 4). The magnificent teratorn was by far the largest of these extinct birds. ♦ The teratorns and their living relatives, the New World vultures are more closely related to the storks than they are to other birds of prey. This is another example of convergent evolution, as they have come to resemble the true vultures of the Old World. ♦ As the bones of these giant birds only survive as fragments, it is just a matter of time before more are found and described, giving us a more accurate picture of how these extinct animals looked and behaved. Further Reading: Paul Palmqvist, P., and S. F. Vizcaino. "Ecological and Reproductive Constraints of Body Size in the Gigantic Argentavis magnificens (Aves, Theratornithidae) from the Miocene of Argentina." Ameghiniana 40 (2003): 379-85; Hertel, F. "Ecomorphological Indicators of Feeding Behavior in Recent and Fossil Raptors." The Auk 112 (1995): 890-903.